The VC 300-TPF is a Hi-Tech Bench Machine with Touch PC and interchangeable wire guides and tensioners. 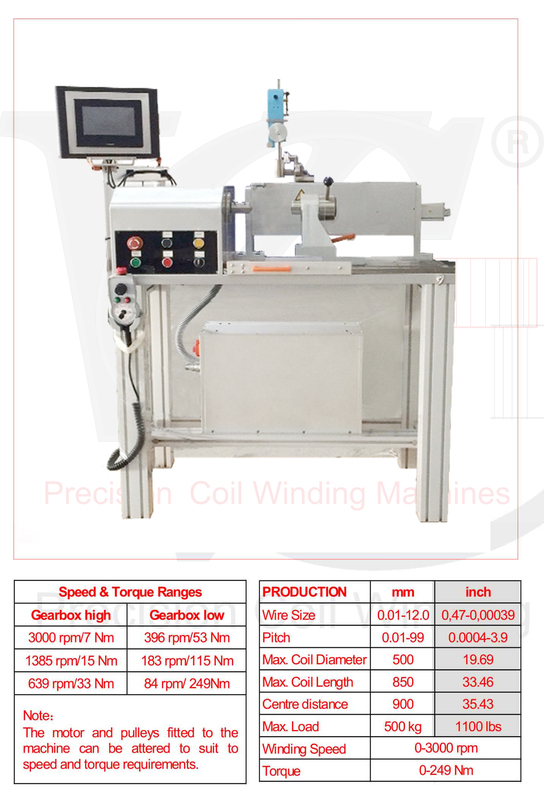 It is designed for precision coil winding applications and built with modern PLC Control and two SERVO motors for main and traverse drive. The user friendly software guides the operator through the programming with clear text and graphical screens. Typical applications for the Bench Machine VC 300-TPF are the production of small coils. The VC 300-TPF is made of high quality steel framework and robust mechanical parts. Two interchangeable motor pulleys are fitted as standard to give a large range of torques and speeds. Optional the machine can be fitted with a programmable 2-step automatic gear change system for changing the speed and torque ranges. The wire guide carriage has been constructed using a precision ball screw and is mounted on a steel bar with linear bearing guides.